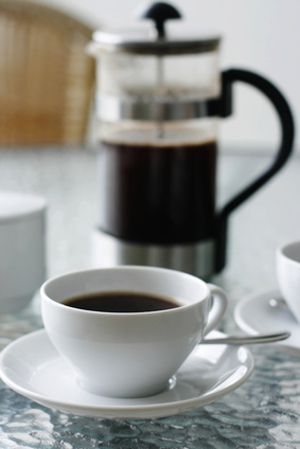 Coffee: neat, pressed and hungry for a shot (of Java & Co. syrup, that is). Photo © Elina Manninen | Fotolia.com. WHAT IT IS: Artisan coffee syrups. WHY IT’S DIFFERENT: Made in small batches to order, these fine syrups—in Original, French Vanilla and TiRUMisu, are a top example of the genre. WHY WE LOVE IT: We love it because of the top-quality ingredients and infusion; we can’t keep THE NIBBLE staff from pouring it over absolutely everything they eat. WHERE TO BUY IT: JavaAndCo.com. Java & Co: Artisan Coffee Syrups Will Wake You Up! CAPSULE REPORT: Millions of people in America walk into their favorite coffee emporium and order their java with a shot of syrup. Amaretto, caramel, hazelnut and vanilla are very popular, and it’s high season for egg nog, gingerbread and pumpkin (how did you think those pumpkin lattes are made)? Most coffee houses use Monin (which makes 113 flavors, not all meant for coffee) or Torani (78 flavors, ditto), and you can purchase bottles for home use. But if you’d like to give a gift of something special—small-batch, artisan-made syrups made from roasted coffee beans, including a “decaf”—Java & Co. has a good thing going. 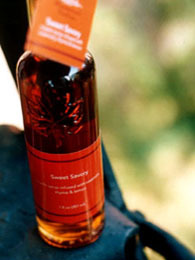 The infused syrups that have so captivated coffee-drinkers are essentially flavored simple syrup (sugar syrup). They have gained visibility with the renaissance of coffee houses, but have been used for many years to make Italian sodas, as breakfast syrups and dessert syrups, and in recipes from glazes to baking. They can make almost any food taste better—but sugar has a way of doing that. Java & Co.’s handmade and hand-bottled syrups—they’re made and shipped to order for maximum freshness—taste that much better than the mass-manufactured products from Monin and Torani. They begin with actual coffee beans, and are a delightful personal gift, corporate gift and sweet syrup for your own pantry. Read the full review below and discover the many ways to use flavored syrups. Moosewood Hollow Infused Maple Syrups. Beyond just breakfast, these flavored maple syrups will hook you with their culinary possibilities. Read the review! 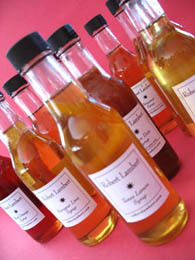 Robert Lambert Syrups. Open a bottle whether you need a great cocktail, salad, entrée, vegetable or dessert. They’re secret panache. Read the review. Savannah Bee Company Honeys. Call it “gourmet honey”; just call it over. As soon as you taste it, you’ll know how different it is. Kosher. Read the review. Java & Co.: Artisan Coffee Syrups Will Wake You Up! This is Page 1 of a two-page article. Click on the black links to visit other pages. 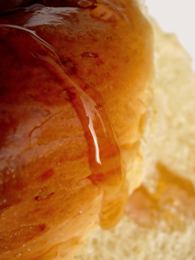 Reviews of more of our favorite gourmet honeys, sugars, and syrups. manufacturers. Only 10% of them got her nod. delectable desserts, starting with cheesecake. Java & Co. is a shining example of America’s wonderful food artisans: Here, a husband and wife team who left careers in the hospitality, food and restaurant business along with the hustle and bustle of New York City and Las Vegas for quiet living in Illinois. After a few years, food and hospitality called again and in 2008, Java & Co. was born. Like so many people who go into artisan food production, Jamie Knoll and her husband had been making coffee syrups for their friends for years. The handmade products start with fresh-roasting and then brewing the coffee beans before infusing the coffee flavor into cane sugar syrup. The syrup begins with roasting fresh coffee beans. Photo courtesy SXC. While they haven’t disclosed their process to us, large manufacturers like Monin and Torani can’t take this type of time and effort with the hundred or so syrups they make. Instead, they’ll buy flavor extracts and mix them with the sugar syrup. 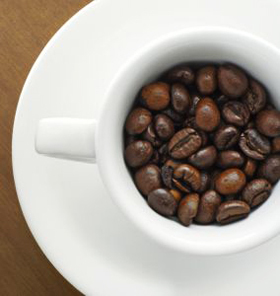 No matter how good the extract, it doesn’t match the quality of a fresh-brewed product. Follow us to Page 2 to check out the syrup flavors in detail.